In the last month of 2017, a meme took Twitter by storm. Everyone was in awe of the size of this lad. An absolute unit. The phrase, though initially applied to the above photo of hotelier David Morgan-Hewitt standing next to Queen Elizabeth II, was soon used as a descriptor for anything large and enjoyable. To quote this helpful explainer from The Cut, "'lad' and 'absolute unit' are opposing terms, like Biggie Smalls, which makes it funnier. And while 'lad' may be condescending, the use of the word 'awe' also implies that an absolute unit is ultimately something or someone impressive, and therefore the phrase can be used as a stamp of approval." During mens' fashion week in January of 2018, everything became an absolute unit. Fashion, particularly menswear, was having a love affair with all things oversized–consider the Balenciaga Triple-S sneaker and the famous seven-layered parka designer Demna Gvsalia would show that August. And the May's Memes account, in which celebrities are photoshopped into enormous jackets and sneakers, is still going strong. For the past two days of New York Fashion Week, I've had absolute units on the brain. Post-Polar Vortex, fashion show attendees seem to be reveling in the ability to wear sleek and figure-flattering outerwear, like that omnipresent influencer coat from Saks Potts. But there have been some nice large boys on the runway, coats you want to curl up in and take a nice long nap. Yesterday, Chenpeng showed a collection of outrageous yet cozy outerwear at Pier 59 Studios. 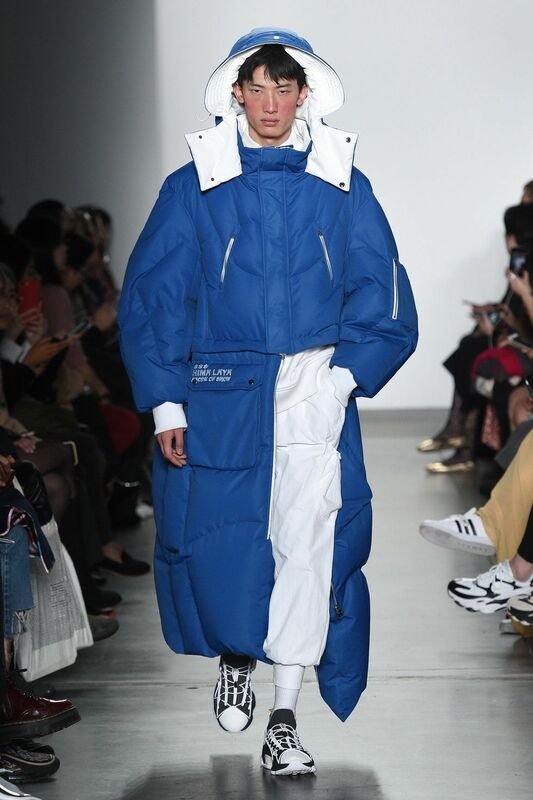 And while designer Pen Cheng played with a number of silhouettes — '80s-esque ski and catsuits, patent leather overalls, board shorts — he specializes in the most absolute of units, the puffiest puffer coats. While most are wide and waist-length, some of Cheng's creations came with skirt-length attachments (not to mention dangling ornaments in the shape of hands that seem to be daring to go viral). The collection was titled Hima Laya, which technically means "snowy land, the home of snow" in Sanskrit. You could probably climb the actual Himalayas in most of it and stay pretty comfy. I wore my own enormous Chenpeng puffer, which has linebacker shoulders and a cavernous hood, to Eckhaus Latta's show in Bushwick today. The brand showed on the same block of warehouses where they've presented for the past few seasons. But for fall 2019, instead of their standard light-filled venues, Eckhaus Latta selected a bunker-like structure–hunkering down for winter, or the Anthropocene. Much of the collection hewed towards late '90s-esque minimalism. It was spare, scrubbed clean. Texture is so important to Eckhaus Latta, and many of the trademark knits on display were refashioned into body-conscious mini-dresses. Two of the best looks were the closers, shown on models Lili Sumner and Paloma Elsesser: Mondrian-style color blocked sets, rendered in a cardigan and bell bottoms for Sumner and a crop top and skirt for Elsesser. But other items things were huge: oversized coats with sloped shoulders, a cropped fluffy shawl made in collaboration with Ugg, a brown jacket deemed the "Yeti." 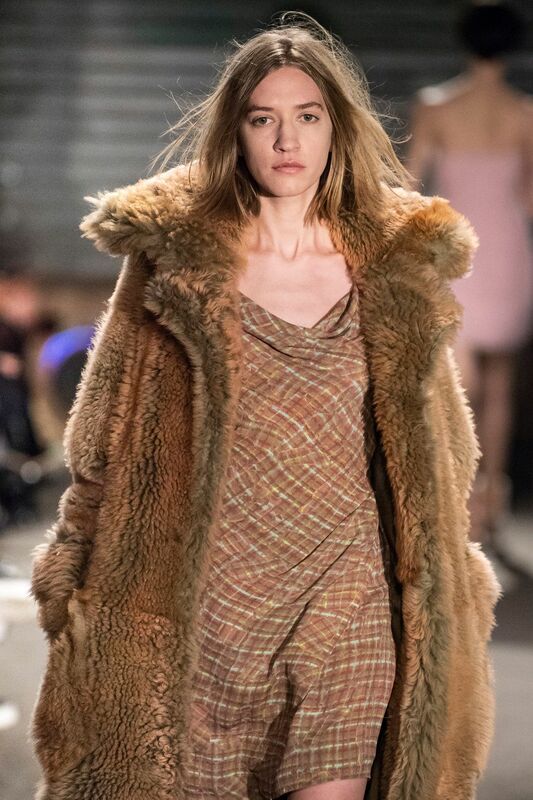 My very favorite look, worn by rockstar progeny Coco Gordon Moore, featured a light, body-skimming mini dress (dubbed the "cross over") underneath a colossal shaggy coat, also made with Ugg. Sorry to be this person, but it was very early Carrie Bradshaw, waiting in a slip and fur coat for Big to meet her in the middle of the night in Central Park. I loved this collection. I loved that there was plenty of sleekness, but that you could also hide in the enormity of coats and knits, pull them over your head and block out the world. Perhaps it's noteworthy that while Eckhaus Latta normally includes a poem in their show notes, this year they were marked with just a bit of red text, in all caps, reading "SOMETIMES LIFE DOES NOT PROVIDE POETRY." It's nice to know that there's the option to hibernate in a Yeti jacket when it all gets to be too much.